Sports are physical activities that involve individual teams competing against each other in order to appeal to certain fans, and they are also used to entertain people. Some of these sports include soccer, basketball, baseball and football. Although these sports are used for entertainment, they are also able to create an opportunity for people to bond with others, which creates a sense of community at school, and it doesn’t matter if you’re a fan or if you’re a player. We at Summit News decided to ask people in our community our essential question: How has sports impacted society and the way people work together in society? This is a question that needed to be answered. Ms. Morris also said, “It helps me a lot with my students; I start a discussion with them about sports, like I have a fight with Jordan saying who is better: Curry or Durant.” Ms. Morris was also very supportive of sports, as she said that sports help her make new friends and they help her understand her students’ views on sports. Several Summit Shasta students were also interviewed. These students were interviewed because of their involvement in sports at Summit Shasta; they are also fans of professional sports teams. The first student who was interviewed was Shasta sophomore Vincent Chu, who plays on the Summit Shasta JV basketball team. During his interview he said, “What makes basketball exciting is to like form close relationships with teammates and the joy of winning a game.” He also said that he can watch “any NBA” game because “you can see your favorite players play and score” and that you can form relationships with your friends while playing or watching basketball. Several freshman, such as Tyler Reyes, were interviewed. 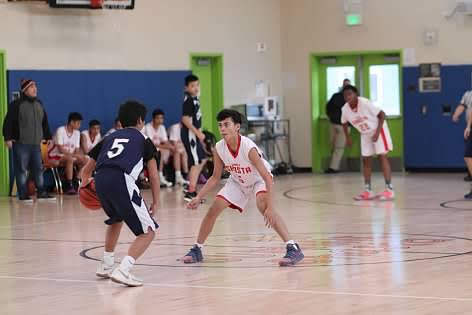 An athlete for the Shasta JV basketball team, Reyes is originally from Los Angeles; this ultimately led to a liking for the Los Angeles Lakers at a very young age. He said that, back then, he found interest in other teams as well, explaining that “some other teams played differently” and he liked watching how they played. Reyes believes that the Lakers’ franchise is “one of the best franchises in the NBA,” which is one of the factors that sticks out to him as a fan. Nowadays, he also finds the Golden State Warriors appealing to watch. As an athlete for a basketball team, Reyes expressed how bonds naturally form within his team: “You have to practice with them every day, and you play games with them. So you build chemistry with them, and you build bonds.” He also said that he “has to make a lot of new friends” as a result of the chemistry in basketball. Shasta freshman Owen Laxa was also interviewed. Laxa is an athlete for the Shasta freshman and JV basketball teams. Growing up he also played baseball and watched football occasionally. Growing up, Laxa was a fan of the Lakers and Heat because they had a lot of good players on their team and they were always winning championships. Nowadays Laxa finds himself watching the Celtics and Warriors, because they are some of the best teams in the NBA. Laxa also stated that playing and watching sports also help create a “bonding experience” with others. Dylan Hadden, another athlete for the Shasta JV basketball team, was interviewed about his experience. He said he only started playing in eighth grade, but he had been a fan of the sport for most of his life. Growing up, he watched the Golden State Warriors “until they started getting too good.” He also expressed his liking for the Portland Trail Blazers. Kevin Kuang is a junior at Summit Shasta. Kuang plays on the Shasta Varsity baseball team. Growing up, Kaung was a fan basketball and football and was not into baseball until sixth grade. He is a fanatic of the Golden Warriors and the 49ers because “everyone else was kinda into those teams, and it’s like being surrounded by someone with the same thinking of you.” Kuang watches the Giants and A’s now because they are Bay Area teams. Most, if not everyone who was interviewed, said that watching and playing sports allowed them to strengthen their relationships with their peers. Throughout the interviews, people also gave a variety of responses that really gave off more of an understanding of sports and how sports help others in their daily lives. They also mentioned that sports allow them to work harder, which means they put a lot of time and sacrifice into playing these sports.